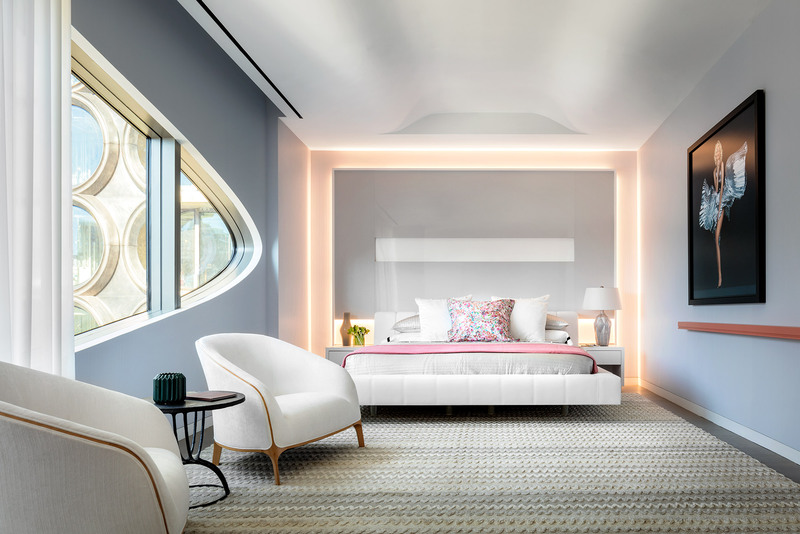 The first images of furnished interiors from Zaha Hadid's 520 West 28th Street in Chelsea—located by The High Line—have been unveiled. The images reveal a 4,500-square-foot, $15 million, four-bedroom condo that looks over The High Line with views onto the Empire State Building and a smaller, 1,700-square-foot apartment. Designer Jennifer Post provided the furniture and decor for the former, being commissioned by developer Related Companies. She used a mixed palette of soft tones and vibrant colors that populate the extravagant interior space. "I am usually the creative visionary behind both the architecture and interior design of a space," said Post in a press release. "Here, I am respectfully creating a vision that coexists with the vision of one of architecture's greatest minds. This prompted me to really consider every move, every decision in a different, special way." For the smaller living unit (which will cost $4.9 million) West Chin, principal of West Chin Architects, employed a minimalist aesthetic when designing the condo's interior. 520 West 28th rises to 11 stories and offers 39 residences that vary from two to five bedrooms. They range in price from $4.95 million to $50 million—the latter getting you a triplex penthouse. 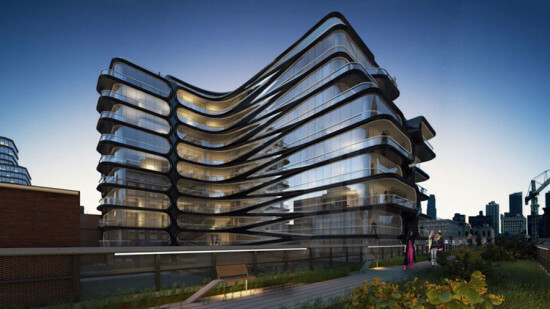 It will also be outfitted with a 2,500-square-foot sculpture deck, art from Friends of the High Line, an automated underground parking lot with a robot-operated storage facility, a double-height lobby, an entertainment lounge, and a 12-seat IMAX screening room. The development will also include a 75-foot pool, a gym, and a luxury spa suite equipped with a spa pool, cold plunge pool, waterfall shower, sauna, steam room, chaise lounges, and massage beds. Construction is edging closer to completion. Move in dates are expected around June this year. Both Jennifer Post's and West Chin's model dwellings will be used as sales galleries for the building. Should you be strolling along the High Line during the next couple weeks, you may encounter a temporary construction shed at the site of Zaha Hadid's condominium project going up at 520 West 28th Street. No typical plywood-and-pipe-scaffolding this, however. A quasi-tunnel of translucent fabric stretches more than 100 feet along the elevated park. And it even has a name. As reported by Curbed NY, the shelter is has been dubbed christened Allongé. (We'll save you the trouble of finding your Larousse; that word translates as "lengthened.") Reassuringly, this Zaha-designed enclosure is sheltered by a code-compliant structure that will protect passers-by from any real falling debris.